Everything tastes better with Swiss Deli Bacon. 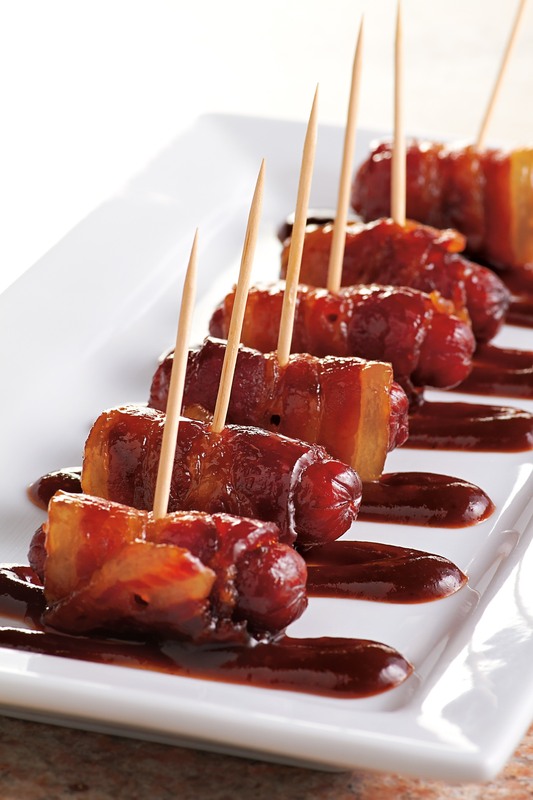 These miniature sausage snacks are simple to make and taste great. The addition of honey gives a caramelised sweet topping. It’s hard to eat just one. Make these for your guests and watch how fast they disappear. 1. Preheat the oven to 200°C/fan180°C/ gas 6. Using the back of a knife, stretch the bacon rashers until double their length then cut in half. Place a rosemary sprig on each small kransky sausage and wrap with half a rasher of bacon. 2. Place in a roasting tin and cook for 10 minutes, then drizzle with the honey and turn to coat. 3. Cook for a further 10 minutes until sticky and golden brown.